Posted by admin in activity reports, Africa, Caribbean, Congo (Dem. Rep.), Ecuador, eruptions, Gaua, Hawaii, Japan, Kamchatka, Karymsky, Kilauea, Kliuchevskoi, Mexico, Nyamuragira, Nyiragongo, Pacific, Popocatépetl, Russia, Sakura-jima, Sangay, Shiveluch, Soufrière Hills, Suwanose-jima, Tungurahua, United States, Vanuatu, Weekly Volcanic Activity Reports. The Smithsonian Institution/United States Geological Survey Weekly Volcanic Activity Report for 27 January-2 February 2010 is available on the Global Volcanism Program website. The following is a summary and not a substitute for the full report. New activity/unrest: Nyiragongo (Democratic Republic of Congo), Tungurahua (Ecuador). Ongoing activity: Gaua (Vanuatu), Karymsky (Russia), Kilauea (Hawaii, USA), Kliuchevskoi (Russia), Nyamuragira (Democratic Republic of Congo), Popocatépetl (Mexico), Sakura-jima (Japan), Sangay (Ecuador), Shiveluch (Russia), Soufrière Hills (Montserrat), Suwanose-jima (Japan). Posted by admin in activity reports, Colima, Mexico. Low-level eruptive activity at Colima, the most active volcano in Mexico, has been causing concern recently. On 26 November 2009 an overflight reported that the lava dome, which began its current phase of growth in February 2007, filled 80% of the summit crater. According to reports of the most recent overflight, which took place on 20 January 2010, the dome now fills 85% of the crater and has reached 65 metres in height. The local civil protection authority, the Unidad Estatal de Protección Civil y Bomberos (UEPCB), reports that there is a risk of dome collapses taking place, particularly in the south-western area of the summit where instability is greatest, but that the current activity of the volcano ‘is not a risk to the surrounding population’. A 7.5-km-radius exclusion zone remains in force around the volcano. Colima volcano in western Mexico has the distinction of being the most active volcano in that country: over seventy eruptions (since 7690 BC ± 500 years) are listed by the Global Volcanism Program, with the most recent bout of activity beginning in November 1997 and still ongoing. 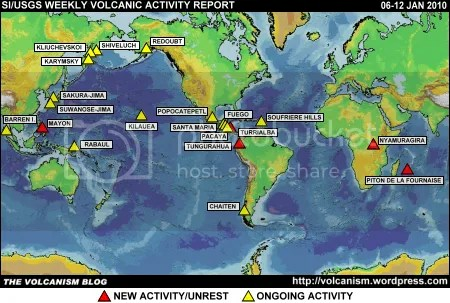 The volcano is situated in a densely populated region, with over 30,000 people living within 40 km of its crater – as a result it is one of the sixteen Decade Volcanoes, active volcanoes seen as posing particularly high risks to populous areas. During 2009 Colima (also known as Volcán de Fuego) has been emitting white and grey plumes that have reached as high as 6.4 km above sea level, and there have been occasional ejections of incandescent material. Both ground and air exclusion zones have been imposed around Colima by state civil protection authorities. The high level of activity has been causing some concern in the surrounding area, with reports of a ‘high possibility’ that the volcano is preparing to erupt; the authorities have responded by playing down reports of imminent risks, while stressing the need for local people to remain watchful and prepared to respond to any increase in activity. 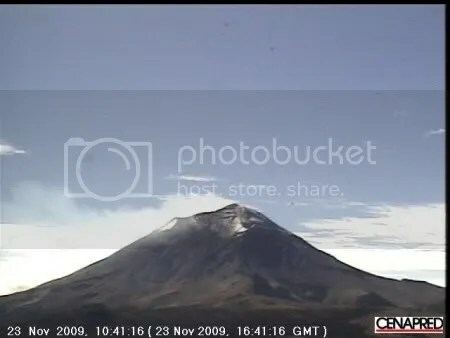 On 26 November there was an overflight of the volcano which reported that the lava dome within the main crater of Colima, which has been growing since February 2007, now blocks 80% of the crater and has attained a height of 60 metres (another news source gives a height of 45 metres, diameter of 270 metres and volume of 2 million cubic metres). Material has accumulated against the western wall of the crater and against a section of the southern wall, which could produce occasional landslides down the western slopes of the volcano. High temperatures were reported within the crater. Fresh lava flows and ejections of incandescent material some 50 metres from the crater were reported on 2 December. The latest available bulletin (2 December) from the Unidad Estatal de Protección Civil Colima reports continuous fumarolic activity and the ejection of incandescent material, without any damage or injuries. Popocatépetl volcano had an active 24 hours over 21 and 22 November, reports CENAPRED, Mexico’s Centro Nacional de Prevención de Desastres (CENAPRED bulletins for November can be found by searching via this archive page). 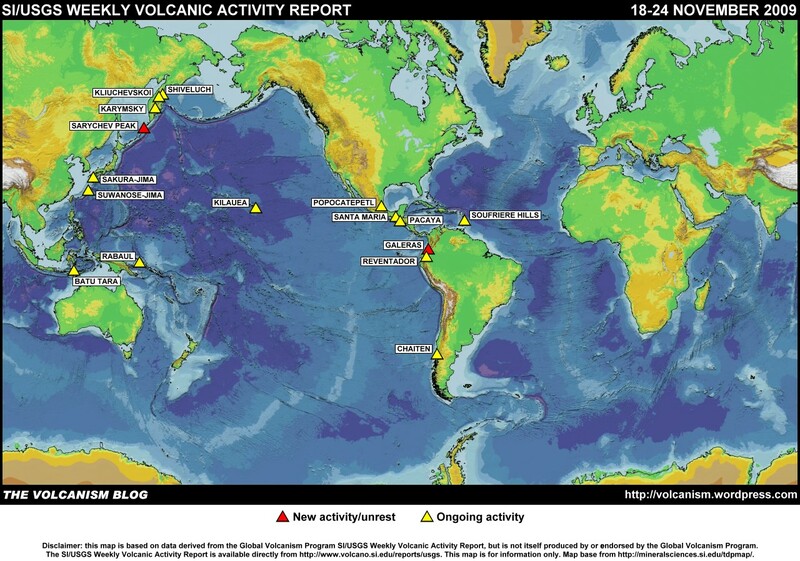 A magnitude 2 volcano-tectonic earthquake was recorded and there were four small eruptive events during the 24 hours preceding 11:00 local time on 22 November, the most significant of which, occuring at 18:31 local time on 21 November, produced an ash column of 3.5 km altitude. 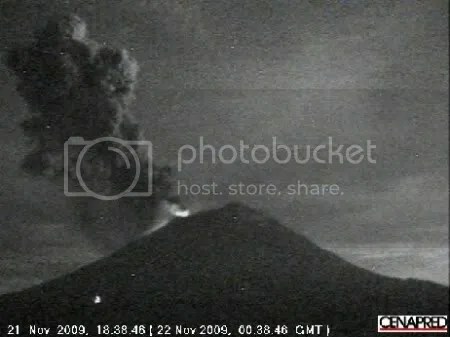 The image above, from CENAPRED’s Popocatépetl webcam to the north of the volcano, shows the situation at 18:38 local time, with incandescence and ash emissions clearly visible. Ashfall was reported to the north and east, across the state of Tlaxcala. The Mexican press (see links below) reports that ash covered vehicles and roads in 38 municipalities in Tlaxcala, but that ash quantities were ‘minor’ and that no problems resulted. Following this event, CENAPRED reports that the volcano returned to its normal conditions. Since then things have indeed been quieter, with Popocatépetl producing a number of low-intensity eruptions of water vapour and gas with little no ash . The alert level for Popocatépetl remains at Level 2, Yellow (Amarillo). The webcam image above shows the volcano releasing a thin, mainly steam, plume at 10:41 local time today.